Featuring Stu Allan, Pianoman, Carl-O and Martyn Evans. 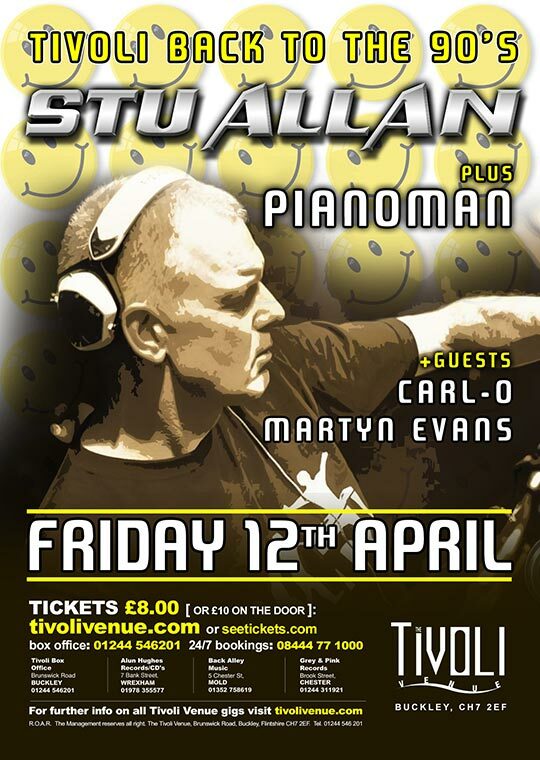 In 1982, Stu Allan took up DJing. Between 1984 and 1986, his mixes/remixes were featured on Piccadilly Radio, Manchester on various shows. In July 1986, he was given his own show on Piccadilly Radio. He was originally filling in for the regular DJ on a 6 week vacation, but the reaction was so great from listeners that he was signed on permanently. He began featuring hip hop and house. “Love Can’t Turn Around” by Farley Jackmaster Funk was the first record Allan played on the radio. This track got the attention of the people in charge of the station and Allan was asked to explain why he was playing this “music”. He said he believed this was what listeners really wanted to hear (having seen clubbers going wild to tunes like “Jack Your Body”, “Jack the Groove” and many other underground Chicago label tunes at his gigs), and convinced them that his choice of music was right when the station’s ratings improved massively. During this period, Allan produced a soul show called “Souled Out” and a hip hop show called “Bus ‘Diss”. He would also have a house hour which would feature the seamless mixing he is known for. Stu Allan was a big attraction at Bowlers in Trafford Park, Manchester. His choice of high energy old school music made him a favourite on the rave scene in the 1990s. Allan was also a regular DJ on the Vibealite rave scene, performing at many of their events across the north of England. Pianoman is the alias of dance music producer James Sammon from Bradford, West Yorkshire who got to number 6 in the UK Singles Chart with the hit single “Blurred” in June 1996. His follow-up to “Blurred” released on 3 Beat Records was from a Belinda Carlisle sample of “Live Your Life Be Free”, entitled “Party People (Live Your Life Be Free)” which narrowly missed a place in the UK Top 40, peaking at number 43.